Russian cosmonaut Oleg Kononenko (center), along with NASA astronaut Don Pettit (left) and European Space Agency astronaut Andre Kuipers, both flight engineers, conducted a spacesuit leak check in their Russian Soyuz TMA-03M spacecraft to prepare for their return to Earth on July 1, 2012. Three astronauts living on the International Space Station will return home to Earth Sunday (July 1) after spending more than six months in orbit. NASA astronaut Don Pettit, Russian cosmonaut Oleg Kononenko and European Space Agency astronaut Andre Kuipers are scheduled to undock from the space station in their Russian-built Soyuz capsule at 12:48 a.m. EDT (0448 GMT) Sunday. 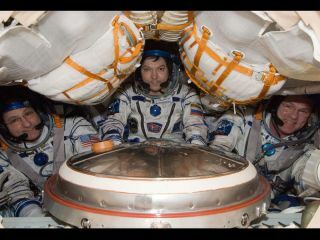 The trio is expected to land at 4:14 a.m. EDT (0814 GMT) Sunday on the Central Asian steppes of Kazakhstan. "When a frontier feels like home, it is no longer a frontier; it has become "civilization." Those determined to wander must now pack their bags and move further into the cosmos," Pettit wrote in a blog post about his upcoming journey home. "Space station is very much on the frontier. It is only my temporary home, and now it is time for me to venture back to my real home." Throughout their mission, Pettit and Kuipers have actively shared their orbital experiences with the public through Twitter, photos and blog posts. Pettit even penned a special poem, called "Last Day in Space," to commemorate his imminent return. During their stint at the space station, Pettit, Kononenko and Kuipers also played host to the first ever visiting commercial spacecraft in May — SpaceX's Dragon capsule. The unmanned Dragon spacecraft was launched to the orbiting outpost as part of a crucial test flight to demonstrate its ability to haul cargo to and from the station. As the robotic spacecraft approached the orbiting complex, Pettit and Kuipers used the space station's robotic arm to manually attach it to the outpost. SpaceX holds a $1.6 billion contract with NASA for 12 robotic cargo delivery flights. Pettit, Kononenko and Kuipers launched into space on Dec. 21, 2011, and arrived at the orbiting laboratory two days later. The spaceflyers began their stay as members of the station's Expedition 30 crew, but kicked off Expedition 31 with the departure of three previous station residents in April. Kononenko served as commander of Expedition 31, but will pass the post on to fellow Russian cosmonaut Gennady Padalka in an official change-of-command ceremony Saturday (June 30), prior to his departure. Padalka arrived at the space station in mid-May with NASA astronaut Joe Acaba and Russian cosmonaut Sergei Revin. The three will remain aboard the orbiting outpost until September. They will be joined by three more crewmembers later in July.